What were you doing 10 years ago in 2006? If you were listening to country radio you were probably listening to Jesus, Take The Wheel. It’s already been ten years since this became the first hit single for Carrie Underwood. It was her big time entrance into the music world and really into the country world and it couldn’t have been much bigger. The song spent six weeks at number one on the country chart including the entire month of February. That’s pretty impressive and not many country songs have held the top spot for that many weeks. Although now looking at the list it seems that a few artists had some big hits in 2006 including Carrie with a five-week number one later in the year with Before He Cheats. Rascal Flatts and Kenny Chesney number one hits that year with multiple weeks at the top. Rodney Atkins had one. Brad Paisley had a couple. 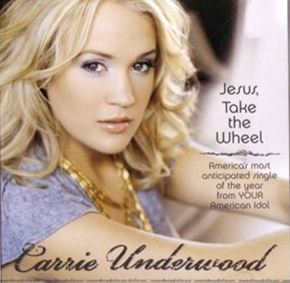 Jesus, Take The Wheel was released in late 2005 and had a steady climb to the top. It was just after Carrie took home the win at American Idol and her first album, Some Hearts, was released in mid-November of 2015. So this was really at the beginning of Carrie’s big time career. The song was a unique one. It really showcased Carrie’s vocal ability, but the song itself was really strong. The women in the song is dealing with the pressures of life and comes to the conclusion that she wants to take control while taking a new perspective on life. There have been jokes about the song and how hopefully nobody was out there letting go of the wheel, but this song really touched a lot of people and remains one of Carrie’s biggest hits, which is saying something. And I can’t believe it’s already been 10 years since it was reigning at the top of the country charts.